Simply go to the Tips 4 Saving Facebook Page and 'like' the FREE $15 Wal-Mart gift card post… AND in order to be eligible leave a comment on the same post letting me know you 'liked' the post. Earn an extra entry for sharing the post! It's that easy! Contest will run from 1/12-1/17. The winner will be randomly chosen and announced Friday 1/17 at 6pm CST. 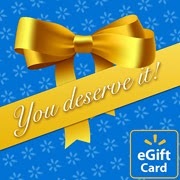 The winner will be notified by Facebook message and will need to provide an email address to receive their e-gift card. Open to US resident 18yrs+. Good luck and Thanks for Stopping by Tips 4 Saving! Don't forget to also 'like' the Tips 4 Saving Facebook page to hear about more exciting tips, freebies and giveaways! Liked, commented and shared, thanks. Thanks for the giveaway! I liked and commented on facebook! like and commented on the post!